What are Fine Motors Skills? Fine Motor Skills are the coordinated muscle movements we make using our hands. Fine motor skills develop as your child’s whole body gains mobility, stability, cognitive, and emotional/social development. This overview will provide an idea of what typical fine motor development looks like, and will provide caregivers with some ideas to help ensure they are offering their children great play opportunities to help them develop their fine motor skills. As children grow, there are typical fine motor skill milestones that they will reach. 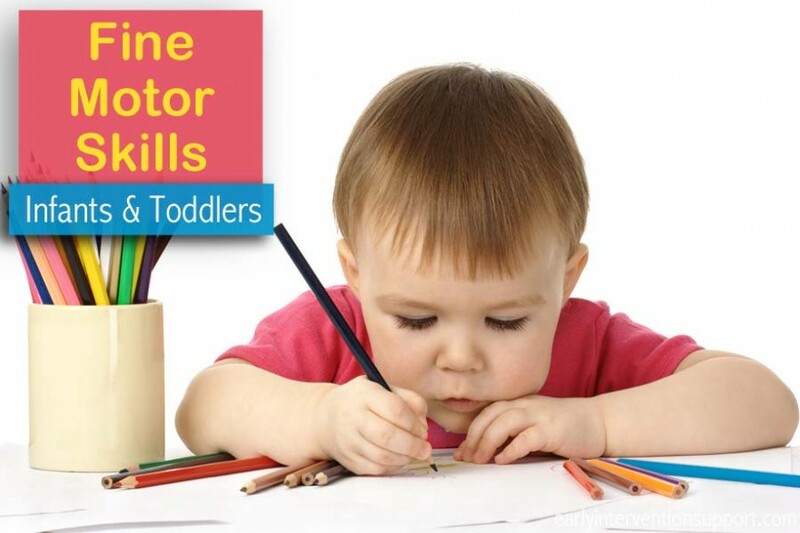 The following articles will detail the typical fine motor milestones that your child will reach at certain ages. To encourage the development of these skills, check out our articles on the Development of the Pincer Grasp, the Development of Hand Dominance, and Finger Isolation Activities. At birth, babies have very little control of their arms and hands. They usually wave their arms randomly and keep their hands in a fisted position. Read more! At this stage, your baby is beginning to have more control of his or her grasp, and will make an effort to hold onto objects. He or she still is not able to let go of them very well, but their hand is starting to mold itself around the shape of the object she’s holding. Read more! Between the ages of about seven and nine months, your baby will probably start getting into a hands-and-knees position for crawling. Even before he actually starts moving forward in this position, the rocking back and forth that he does is very important to his hand development. Read more! At this level of development, your baby is favoring use of one hand. While viewing books, he or she will be pointing to pictures.He or she will be gripping objects and releasing into a container. Read more! By 18 Months, most toddlers can build a tower using 2 cubes, use hands together at midline (middle of the body), scribble and point with their pointer finger. Read more! Fine motor skills for toddlers will be refining at this level. Your toddler is able to make circular scribbles and imitate vertical lines. Crayons are held between thumb and fingers. Read more! By 30 Months, Most Babies can fold paper in half, imitate simple pencil markings, such as a cross and build a tower up to 8 cubes. Read more! Most Three Year Olds can string four large beads, turn single pages, and snip with scissors. Read more! Stability is the strength and balance control to keep one part of the body still while another part moves. Bilateral coordination is the efficient use of both hands during activities. One hand will manipulate while the other is the ‘helping hand.’ Bilateral coordination development will lead to hand dominance (right- or left-handed). Sensation is knowing where your hands, arms, and fingers are, and how they are moving. Once the building blocks are established, your child develops dexterity, meaning that he or she will use small, accurate, and precise movements to open containers, pick up tiny objects, stack blocks, and many other skills.